Becoming weak and feeble as one ages is not a result of aging itself but a result of inactivity. Slow controlled loading of your muscles along with adequate resistance can rapidly rebuild your strength and youthful vitality. Truth is, building muscle strength and health through resistance training is a direct path to the “fountain of youth.” There is no quicker way to regain your youth. There’s no big mystery about it. If your muscles are strong your life will also be strong, vital and active and reversely, if your muscles are left to weaken and shrivel up, so too will your life, one is a result of the other! Without the ability to be vitally active, muscles continue their downward trend and it becomes a vicious destructive cycle of “no activity” leading to more muscle mass leading to “no activity” and so on. The equation is easy: becoming stronger by building your muscle mass helps you remain active your entire life. Remaining active keeps you alive. Only proper strength training is capable of preventing age-related muscle loss. All other forms of exercise, although valuable in other ways can’t get the job done when it comes to pushing the clock back. 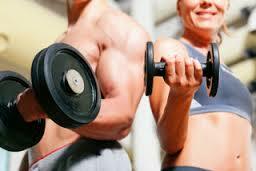 When strength training, your muscles exert a force against some type of resistance to condition the muscular system. The source of resistance can be free weights or machines…it doesn’t matter. All that matters is that you are briefly working your muscles on a regular basis…a little more than they are accustomed to working. The amount of resistance a muscle must work against determines how strong it gets. Your muscles, ligaments, bones and tendons will all respond to this resistance training by getting stronger, your joints become more stable making you less prone to falls and injuries, your self-esteem and self-confidence soar and your life reflects this health, vitality and strong mental attitude. Although some types of aerobic machines such as elliptical and stationary bikes use some form of “resistance” to increase the workout intensity it is not the same type as strength training. Neither is walking or running. Runners are still subject to muscle loss and walking, although a great exercise for other reasons, is not enough to maintain overall muscle mass. In other words…they don’t make you stronger and we need to get stronger as we get older. The results come quickly when you train using strength training. In as little as six months time, strength training has the ability to turn back the body’s molecular clock and rejuvenate ageing muscles to the extent that they are almost as powerful as those found in much younger people. Remember, nothing in life comes free. Everything has a price tag, and, that includes your health and vitality. A small investment of time, energy and effort in strength training now pays huge dividends. The only cost is one to two dedicated and challenging sessions per week. At what cost do you put your health? Are you willing to pay the price? The very real mind-body connection is real and needs to be acknowledged, and attended to or the walls of your carefully architect created vision of the future will eventually come tumbling down.